The above equation is the balance equation of the Wheatstone bridge. As has been mentioned above, the bridge consists of four resistance arms as shown in the Figure. Resistors R1 and R2 are named as the ratio arms. The resistance R3 is called the standard arm. There will be no resistance present in the fourth resistance arm. The unknown resistance R4 takes the place of the fourth arm. Ratio control switch will be provided in the practical Wheatstone bridge. The switch permits switching of the resistance of the ratio arms in decade steps. The resistance of the standard arm will also be provided with a switching arrangement usually in four steps for balance adjustment. 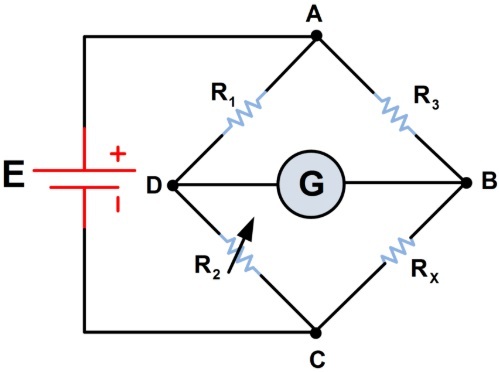 Wheatstone bridge can be used to measure resistance from 1 ohm to few mega ohm. The value of resistance indicated by this bridge, is dependent on the proper calibration of the null detector, either galvanometer or sensitive current meter.